Because I Said So! is a conglomeration of research into scads of the well-meaning but outlandish exclamations your parents spouted at you in your youth. "Don't go swimming for an hour after you eat!" "Stay away from the poinsettia - it's poisonous!" "If you swallow your gum, it'll stay in your stomach for seven years!" And my personal bugaboo - "Don't crack your knuckles, you'll get arthritis!" 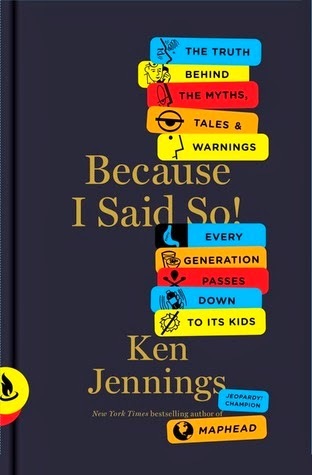 At turns hilarious and serious, Ken Jennings gathers research and scientific findings that address dozens of these parental edicts passed down through the generations. "That's the dirty secret of parenting: it's a big game of Telephone stretching back through the centuries and delivering garbled, well-intended medieval bromides to the present." I distinctly remember, for example, my mother carefully inspecting every piece of Halloween candy we gathered trick-or-treating. She never explicitly said that she was inspecting it for signs of tampering or poison, but the strictness with which we were charged not to eat any candy until mom had checked it out impressed upon my young mind that there was some hidden danger of which I was not aware. Ken Jennings to the rescue! That's because there hasn't be a single reported case of a Mad Halloween poisoner in history. Another standard of my childhood that I have carried on as a parent is that during recovery from a stomach bug, little sips of ginger ale is the first step back to "real food". But Ken Jennings points out that the Centers for Disease Control actually discourages soda for upset stomachs "because too much sugar in your GI tract can cause osmosis, which will make diarrhea worse." In addition, the carbonation can cause bloating, and there isn't enough nausea-calming ginger in standard ginger ale to actually help, well, calm the nausea. Pedialyte or diluted fruit juice are better options. Thanks for taking that single silver lining of stomach flu away, Ken. Oh, and that gem about how eating carrots is good for your eyes? We have military misdirection during World War II to thank for the popularity of that tidbit. Britain's Royal Air Force claimed that its pilots' impressive accuracy shooting down German bombers was due to "megadoses" of vitamin-A-filled carrots to hide the fact that they'd invented airborne radars and installed them in their fighters as early as 1939. Jennings takes a more serious tone in the section titled "Just ignore bullies and they'll leave you alone!" In fact, he says, that advice is "in many cases, the worst possible advice" and adult shorthand for "I have no idea how to solve your problem, which makes me uncomfortable." Using recent research on bullying, he explains that "bullies are looking for the path of least resistance, and many will interpret silence as acquiescence: they got away with it, they 'won,' they'll come back for more the next time they need peer validation." A lot of times - 22 percent of the time, according to a study done in 2012 - ignoring a bully "actually made things worse." The better option? "Telling someone--a parent, a teacher, or a friend--worked in up to 38 percent of all cases." Rather than telling kids to "solve their own problems" or "don't tattle", we should be teaching them "smart coping strategies" like "standing up for themselves, enlisting peers to help, confiding in adults" - the same strategies adults would use if they were being harassed. Each article is brief and entertainingly presented. The ones that stick in my head were the ones I heard most frequently as a kid, so I'm sure those that were a part of your childhood will be most meaningful to you as well. All in all, an interesting and educational trip down memory lane.